First of all, how beautiful is that baby Shea?! I love her so much and I am so happy she is finally here! I am so behind on blogging, I don't even know where to start. I am working on a Christmas Break recap and then McKenna's Golden party but first I have to share the most AMAZING story! McKenna is basically a celebrity y'all. 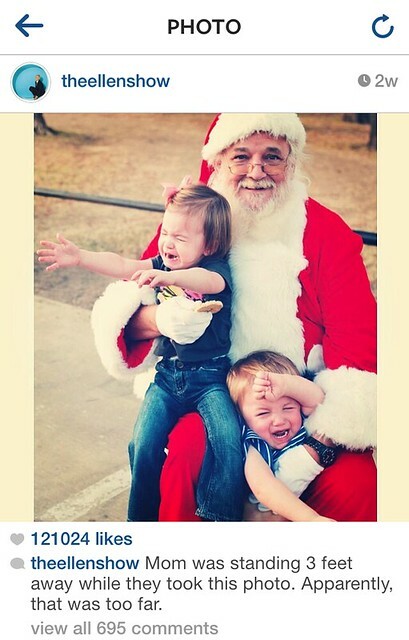 Anyways, last year (as in 2012) McKenna had two Santa experiences. The first was the typical mall pic with her and Ella. The second was at my parents neighborhood park during a Christmas event. 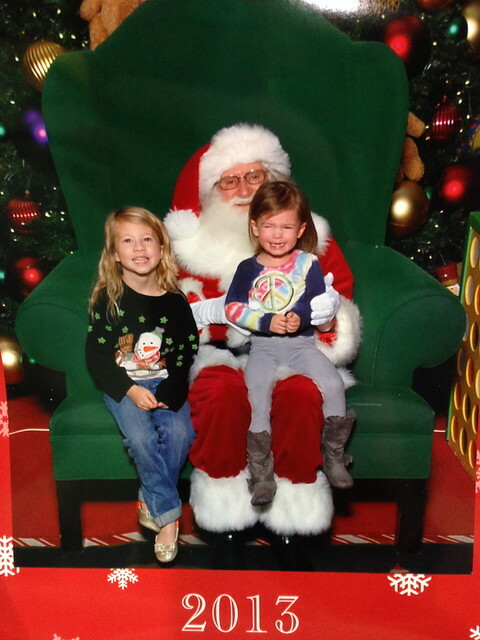 Brittany and Cooper were there too so we decided to get a Santa pic with them both. It was pretty epic. We both sat on my parents couch that night cracking up about it and saying how Ellen would love that pic for her "bad santa photos" segment. So we totally submitted it and waited for her to show the pic on her show. It never happened. So about a week before Christmas this year (as in 2013) I am on instagram just scrolling through the pics and this pops up! I stare at it wide eyed for a minute and can't believe what I see! It was the picture of McKenna and Cooper that we sent into Ellen over a year ago! She instagramed it! My daughter was on Ellen Degenere's instagram and I couldn't get over it! I immediately called Brittany and we both began to freak out. Defiantly the most likes and comments I've ever had on a pic! It made my day. Made my year. McKenna and Cooper will be ready to sign autographs in a couple years. fantastic! You are well on your way to making an Ellen Show debut! !